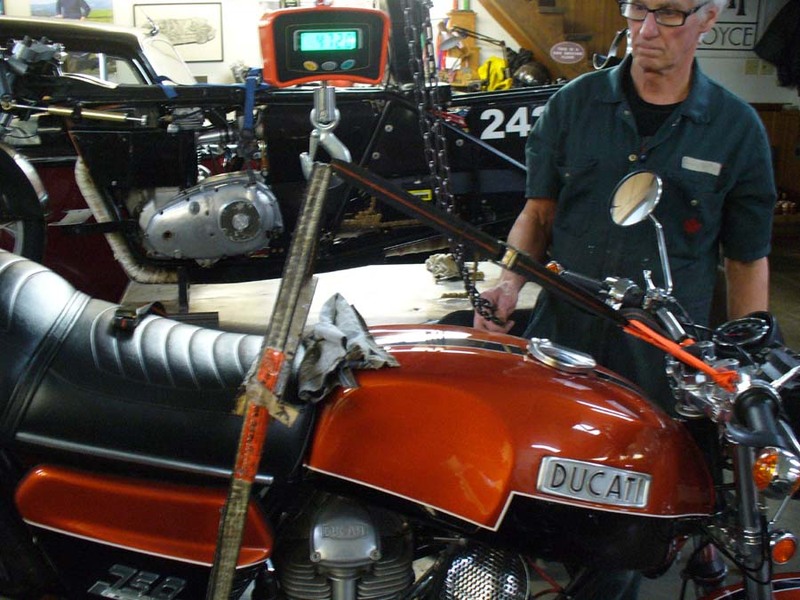 Spring's coming early here, but still a ways to go before getting more than just the Guzzi insured. lucky there's been project work in the shop. Just finished up a complete wiring and accessory installation for a guy that's building a custom '99 900SS with all manner of non-standard stuff. Last edited by geodoc on Sun Dec 30, 2018 6:19 am, edited 1 time in total. A handy little device showed up at the shop - a digital hanging scale. We immediately started weighing various bikes. The 750 GT came in at 472 lb. with full fuel, oil & tool kit. Minus 27 lb. fuel (4.5 US Gal.) & tool kit = 442 lb. Minus 9 lb. oil = ~ 433 lb. dry weight. A stock 1974 T150 Trident no fuel was 466 lb. My 2001 Triumph Sprint RS with full fuel 535 lb. My 1974 Guzzi Loop Frame came in at 524 lb. full fuel.